The goal of most romantic visual novels is getting the partner of your dreams. That isn’t the case with Arcade Spirits, a game about taking ahold of your destiny and finding true happiness. Developed by Fiction Factory Games, the game takes place in the future of 20XX where the 1983 video game crash never occurred. The story follows the player doing the best to break the family curse and chase their dreams. After losing another job, they’re encouraged by their best friend, Juniper, and a new helpful AI assistant Iris, to find a career they’ll truly love. What starts as a mindless job behind the prize counter in a small arcade turns into the opportunity of a life time. The game features a diverse cast of loveable characters who go beyond their portrayed stereotypes. Naomi is the cute retro arcade enthusiast, Gavin is the seemingly stiff accountant, there’s the loveable and ambitious Ashley, Francine the motherly arcade owner, Percy the gruff gamer with a huge heart, Teo the fiery dancer, and Queenbee the fierce pro gamer. Like other visual novels, you get to know the characters better based on your interactions with them. There’s even an optional romantic subplot giving you a chance to win over your favorite person. With their distinct personalities, witty dialogue, and stellar designs it’s easy to get attached to the cast. Arcade Spirits’ strongest asset is the amount of choices it gives you. You make decisions as small as choosing your favorite arcade game to as big as how to confront your rival. You can even customize your character, though the options are limited. Your options play a big role in determining what kind of person your character is (gusty, kind, quirky, logical, basic). Unlike other visual novels where your choices are about pleasing your romantic interest, here they impact the gameplay. They control how you react to difficult situations. And in certain instances, you can even make the wrong choice leading to failure. Having so many options at your fingertips makes the game replayable. Not only will you want to spend time with all the characters, you’ll want to see how different responses affect the story’s outcome. Part of what makes the game so charming is the aesthetic. The universe is bright and colorful with eye catching neon accents in the overall design. Everything from the dialogue boxes to character portraits are illuminated adding to the retro vibe. The 8-bit inspired soundtrack not only captures the game’s world but is catchy. The music will play in your head long after your shut it off. And the writing is solid featuring clever references to video games like Polybius, Pac Man, and Teenage Mutant Ninja Turtles. It’s not only cute, but it’s a love letter to the days when arcades ruled the world. The game does a great job at capturing that vibe and is surely to give retro gamers a heavy dose of nostalgia. Unfortunately, the game’s low point is how rushed the story feels. The timespan is only mentioned a few times but is unclear for the most part. The events happen in such a short amount time it’s hard to suspend disbelief in certain situations, like when your character falls deeply in love with someone they’ve known for two months or how quickly they decide running an arcade is their lifelong dream. If the game was a chapter or two longer moments like this wouldn’t stick out. Also, while the customizable player is a nice touch, it’s very limiting. It would’ve been great to get one or two additional hairstyles or accessories to choose from. Luckily, these are minor issues and isn’t enough to affect gameplay. And the team seems to have additional content planned for the future. 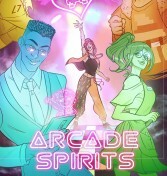 Arcade Spirits is a blast to play. The visuals are eye catching, the characters are endearing, and the amount of choices keeps you coming back. It goes beyond your standard visual novel to give a memorable experience. While parts of the game feel rushed it never seems lazy. Clearly, everything about this project was done out love for games, gamers, and retro arcades. Not only is it a story about finding your own happiness, it’s a loving homage to retro arcades. If you’re looking a romantic visual novel with a different angle, then definitely check out this game.